Andrea Pirlo is the cog upon which Italy’s wheel turns. That was evident at last summer’s European Championships where he commanded the Italian midfield with his elegant poise. It was his bursting run that led to the opener against Spain, his sumptuous free-kick opened the scoring against Croatia, his two assists unlocked Ireland and his panenka that demoralised England. Against England especially, he was the kingpin in midfield, rarely troubled and always seemingly in acres of space to launch threatening passes. For opponents, that should thus be a no brainer – stop Pirlo, stop Italy. Of course, that is easier said than done. England tried, but just could not live with his exceptional movement across the pitch. Joachim Loew on the other hand overthought his system and only managed to weaken his team in the semi-final. The only team to have gotten the better of Pirlo was Spain in the Final. They on the other hand have this magnificent midfield. As Italian journalist Filippo Ricci remarked moments after the final, Italy had Pirlo. Spain had 4 of them. Yet, since then, it seems a solution may have been found .On Match Day 1 of the Champions League, Chelsea tasked Oscar to track Pirlo whenever Juventus had the ball, then storm past and ahead of him whenever Chelsea regained it. It worked for half an hour, before Juventus found other areas to exploit Chelsea. But Oscar’s role somehow nullified the Italian maestro. Fiorentina did the same in Serie A with Adem Ljajic performing the Oscar role to good effect. When Juve lost to Inter, Andrea Strammacioni capitalised on the drop in Juve’s momentum by introducing Fredy Guarin whose energy kept pushing Pirlo backwards. By pressing up on Pirlo, teams found a way to slightly nullify his influence. Pirlo though is still a great player, and not just anyone can do that job on him. It requires players of some quality. In World Cup Qualifying, Malta had tried the same resulting in a laboured 2-0 win for the Italians. Bulgaria had done the same also – they managed to hold La Nazionale to a 2-2 stalemate. It is not as easy as it sounds, but the more it is practised, the more the probability that it might work increases. With exposure comes experience and innovation. Prandelli is fully aware of this, and seeking a solution to this is clearly on his mind. Especially after how Czech Republic’s Tomas Rosicky recently managed to get the better of Pirlo in a World Cup Qualifier prior to the Confederations Cup. But also, the 2-2 draw with Haiti in Brazil showed other problems that had been hidden under the microscope for some time now. Looking a bit flat and ineffective upfront, Prandelli must look for a solution to counter this as well as the Pirlo problem. It is no wonder, as reports suggest, he has been tinkering with a 4-3-2-1 formation in training. The ‘Christmas Tree’ formation is meant to ensure that Italy’s opponents are not granted any gifts. As it stands, Stephan El Shaarawy would be dropped from the attack, with Emanuele Giaccherini playing with Riccardo Montolivo as a duo behind the lone striker, Mario Balotelli. The three of Claudio Marchisio, Pirlo and Daniele De Rossi would remain to screen the back four. The back four is still a mystery, but Christian Maggio, Andrea Barzagli, Giorgio Chiellini and Milan’s young talent, Mattia De Sciglio may get the starting berth. Of course, if De Sciglio’s inexperience does pose a problem, Leonardo Bonucci may come in to form the defensive pairing with Barzagli, with Chiellini being pushed wide to left back. By going with this formation, it solves both of Italy’s problems. It gives them a bit of creativity as Montolivo is pushed further forward than where he normally plays in the diamond. It also ensures that Alberto Aquilani can also fight for a position as one of the two behind Balotelli. It also crowds the area around Pirlo with midfielders making it harder for opponents to get to him. Like a game of chess, Prandelli is looking to surround his king with rooks, bishops and knights. With the squad he has picked however, certain questions may arise as to the players on the bench. Alberto Gilardino would be a straight swap for Balotelli, but where would El Shaarawy go. On the other hand, the two positions behind the Milan striker seem to require too much discipline to entrust Sebastian Giovinco with. And Antonio Candreva, the Lazio winger who has been a revelation in Serie A would surely not have a position. But this formation will however form a range of options for Prandelli from which to choose from. He already has his tried, tested diamond formation, as well as a 4-3-3 (which highly suits Candreva and El Shaarawy). In his locker, he also has the 3-5-2 with which he played the first two games of Euro 2012. It points to how Italian trainers are coached at their football center at Coverciano. That quality of encouraging managers to experiment with a series of formations may just come to Italy’s aid – as long as it does not end up confusing Prandelli. There are two ways to deal with a problem as influential as Pirlo. One involves completely getting rid of him and going in a different direction (the old king is dead, long live the king) as AC Milan did some seasons ago with Pirlo. The other is re-inventing and re-imagining around that problem till it becomes of value once more. 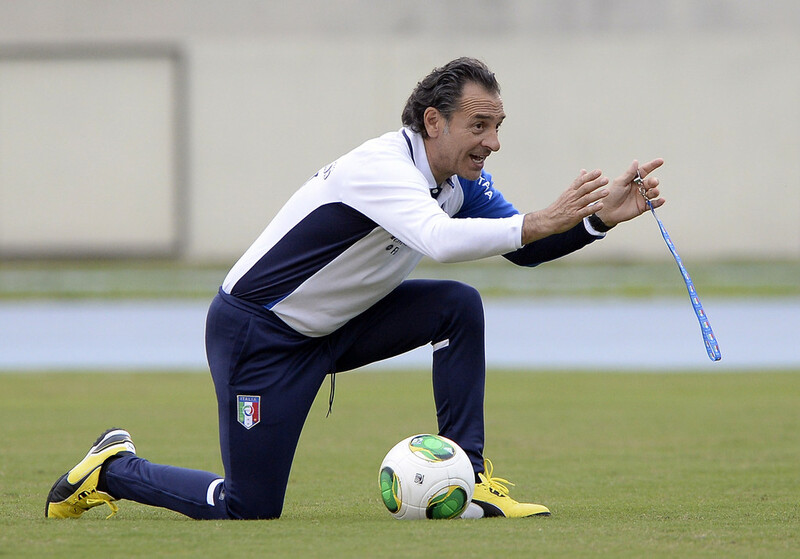 Prandelli has so far relied on the latter, and it is what he has to do again. The most important player of his generation is proving to be Italy’s most important player. As such, the irony of life is that extreme opposites eventually produce opposite extremes. Bright light can be blinding just as much as ultimate genius brinks on insanity. Great strengths become great weaknesses. Pirlo though is too valuable to discard. He is a delightful conundrum to have – an even more delightful player to possess.